My brothers and sisters in Al Islam, I often say, "Faith without knowledge is dangerous." Please cry out to your Lord in the day and the night, "O my Sustainer! Increase my knowledge." 20:114. Do not let yourself be mislead like those of old nor let yourself fall into the traps of the unscrupulous amongst us who are working so hard to destroy our great religion. You can see the results of people like me when you look to the misguided Muslims today who say thet the woman's khymar need not cover the hair, only drape over the bossom. You can also see it in ploys like George Bush's when he quoted out of context, "...And if they incline to peace, incline thou also to it, and trust in Allah..." 8:61. Of course, Bush never bothered to mention that this verse was cradled in a lesson about inclining to peace if you have the power to maintain the peace. Why should he? He succeed in misleading the ignorant Muslims who followed his lead and were thrilled that he was even able to quote from the Quraan. It served its purpose. Thus, we can see that faith without knowledge is dangerous. It opens the door for misguidance and straying from the deen of Allah. So what is a Muslim to do? The first step is to make a clear intention. We must want to seek knowledge for the sake of Allah. We must recognize that Allah has made it obligatory on us to have the basic knowledge of our religion, and then we must seek to acquire that knowledge for His sake and His sake only. This is of extreme importance. Remember the lesson about the first three who will be dragged into the hellfire. The first man (whose case) will be decided on the Day of Judgment, will be a man who died as a martyr. He shall be brought (before the Judgment Seat). Allah will make him recount His blessings (i.e. the blessings which He had bestowed upon him) and he will recount them (and admit having enjoyed them in his life). (Then) will Allah say: What did you do (to requite these blessings)? He will say: I fought for Thee until I died as a martyr. Allah will say: You have told a lie. You fought so that you might be called a "brave warrior". And you were called so. (Then) orders will be passed against him and he will be dragged with his face downward and cast into Hell. Then there will be brought forward a man who acquired knowledge and imparted it (to others) and recited the Qur'an. He will be brought, Allah will make him recount His blessings and he will recount them (and admit having enjoyed them in his lifetime). Then will Allah ask: What did you do (to requite these blessings)? He will say: I acquired knowledge and disseminated it and recited the Qur'an, seeking Thy pleasure. Allah will say: You have told a lie. You acquired knowledge so that you might be called "a scholar", and you recited the Qur'an so that it might be said: "He is a Qari" and such has been said. Then orders will be passed against him and he shall be dragged with his face downward and cast into the Fire. Second, we must recognize that there exists a lot of wrong information in our nation. Those who have transferred knowledge without foundation and those who have deliberately tried to destroy our deen have been very busy over the centuries, and now, the search for the truth is a bit more complex, so we must learn the basics from scratch. Do not assume that because your parents were Muslims that everything you learned is correct. You must investigate for yourself. Once you reach an age where you can research it, you need to go back and verify from the original sources. Are you making salat or wudu the way the Prophet did? Or are you making it according to the way your parents, your culture, your imam etc. did? One of the signs of the last day is that religious knowledge will be taken away and that we will be taught by those who have no knowledge. This is a very real danger! We can already see this in our masjids and our homes. People find it so easy to say what they think is correct when they have never researched it for themselves. Most cannot even tell you where they learned something or where you can find the dalil (evidence) but they will fight you about its correctness, even when they are presented the Quraan and Sunnah that proves the opposite. Allah Preserve us! I was once in a masjid when a sister who seemed to have good intentions said to the other sisters that regardless of what they choose to do on the outside, that when they make salat, they need to be sure that they are properly covered. They need to make sure their headpiece is big enough and not see-through. They need to be covered with a loose dress of skirt that covers all the legs and the feet; they need to make sure their clothes is neither see-through or tight. This is so that their salat will be accepted by Allah. They must meet the minimum requirements. The reaction was that a group of sisters got upset with her, and said to her, "Who are you to teach us our religion?" They claimed the religion of their fathers. They had come from the best Muslim countries and they knew right from wrong, and they did not have to go to these extremes. The sister was taken aback by this, but kept her calm long enough to show bring them the Quraan and a few of the hadiths that spoke of the minimum cover for women. The women literally waved the books away and said, "Don't give us this, what do the scholars say?" She tried to tell them the opinions of the four schools, and they rejected these. At this point, from all the insults that were coming from these women, the woman gave up, and went to a room to cry. She had been humiliated and insulted for bring forth the clear teachings of Allah and His messenger. This is the state our nation has fallen to. Allah guide us! But once we have learned, we cannot allow it to remain stagnant. We must pass on this knowledge to our brothers and sisters. Narrated Abu Hurayrah: Allah's Messenger (peace be upon him) said: When a man dies, his acts come to an end, but three, recurring charity, or knowledge (by which people) benefit, or a pious son, who prays for him (for the deceased). Sahih Muslim: Book 12, Number 4005. When we teach the correct knowledge to our husbands, wives, children, family, friends etc..., we will receive a continuing blessing. Imagine the blessing of teaching Fatiha to a child or a new Muslim. Every time he/she says it in salat, it is a blessing on your scale. Every time he/she teaches it to someone else, it is a blessing. This one small deed, done sincerely, can be for us a mountain of blessings on the day of Judgement while we know it not. But in teaching, we need to be very careful. We cannot teach what we do not know. The scholars agree that half of knowledge is knowing when to say, "I don't know." We need to remain silent when we cannot bring the dalil. We must not teach that we cannot verify. Instead, we lead the person to one of knowledge. We cannot give fatwa unless we are trained to do so. Nor should we seek fatwa from one who is not trained. You would not go to a nurse and ask her to operate on you. You would go to a doctor. The nurse can help you with a limited service, but she is not trained for surgery. In the same way, you may ask a man or woman of limited knowledge for some basics which he/she can verify but you cannot ask them for fatwa. And if you know you have limited knowledge, you must never give fatwa. Narrated Ibn Masud: I heard the Prophet saying, "There is no envy except in two: a person whom Allah has given wealth and he spends it in the right way, and a person whom Allah has given wisdom (i.e. religious knowledge) and he gives his decisions accordingly and teaches it to the others." Sahih Bukhari: Volume 2, Book 24, Number 490. But, we must recognize our limitations. Islamic knowledge is not something you can acquire in a few days, months or years. It is a lifetime of study. Most scholars are not even experts in all, they specialize: Usool al Quraan (Quraanic Sciences), Usul al Hadith (Hadith Sciences), Islamic History, General principles of Islam etc... It is not an easy matter. And remember, the sin for the insincere seeker of knowledge is so great because the responsibility is so large as is the reward. "The first shaheed, the first martyr in Islam, Sumaiyyah, radiallahu 'anha, a WOMAN! The first person to give his life of this religion -- before the men -- the shaheed. Aiesha, radiallahu 'anha, reported the second most hadith over 2,210 hadiths, authentic traditions. 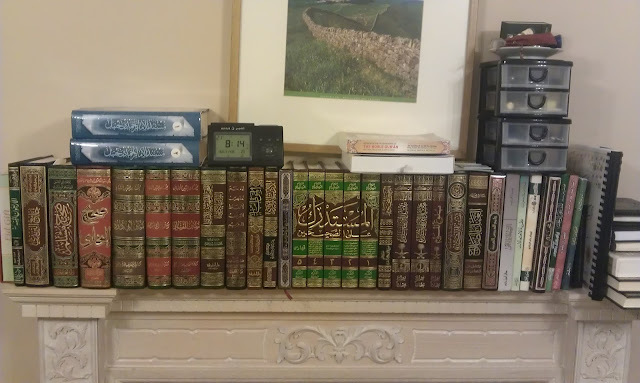 When you are reading hadith you are mostly reading Abu Hurairah, or Aiesha, may Allah be pleased with them. So a woman is not supposed to be educated??? A woman is not supposed to know "isnad" (the chain of hadith) ??? Not supposed to know tafseer??? When men used to come to her to learn about the tafseer. Shalaby reports that Nafeesah, who was a descendent of Ali, radiallahu anhu, was such a great authority of the hadith traditions that Imam Ash-Shafi'ie, rahimahu Allah, learned from her when he was in Al-Fustaat, which is the original Cairo. Shalaby also reports that Kareemah bint Ahmed Al Marwazi, may Allah be pleased with her, was a transmitter and interpreter of Sahih Al-Bukhari. Muhammed Al-Abrashi wrote that Ibn Asaakir, a famous hadith transmitter, had over 80 women ("thamaneena mar'ah) among his highest regard of the 'ulema. 80 women who he regarded at the highest level of scholarship. It is also reported that for As-Suyuti, rahimahu Allah and Ibn Hazm, rahimahu Allah some of their teachers were women. It is also reported: Fatima bint Maalik Ibn Anas was a famous student of "Al Muwwata". And so we can go on and on speaking about women and education; the seeking of knowledge (talibul ilm) is fareeda ala kulli Muslim -- all Muslims are supposed to seek knowledge male or female. If the woman in your house does not know halal from haram and you are out fi sabeelillah and you come home to eat food, the food that you eat may be haraam. If she doesn't know Qur'an, if she doesn't know Sunnah and you are away, how will your children learn? Much of their time is spent with their MOTHER. And so an educated woman is a positive thing for Islam; and it is ignorance, it is "jahil" when the man is stopping her from Islamic education." We must all learn the religion, and there is no proof (actually the contrary is proven) that a woman has a lessor ability to act as a teacher. As long as all Islamic etiquette is in place, it is both allowed and from the sunnah of our great companions who took Umm al Mumineen, Aisha as their teacher. Finally, I leave you all with this: Knowledge is incumbent upon us all. If we allow ourselves to remain ignorant or to follow whatever so-called scholar the wind blows in, we are a doomed nation. We must be able to differentiate between true knowledge and hogwash. A few hints: When your scholar starts saying, "I think..." or "I feel..." without giving Quraan and authentic hadiths, start worrying. When your scholar starts to teach you something that directly contradicts the words of Allah or the Sunnah of the prophet, get very worried. And when your scholar starts to have vision, run!!!! May Allah guide us all to the straight path. May He give us knowledge and faith and protect us in that faith till we die. And may we all die as Muslims loving, fearing and worshipping Allah as He commanded us to do and taught us to do through our beloved prophet's teachings and examples. Ameeen!